Brasenose offers High Speed network connections to every residential room in college. The minimum connection speed offered is 1000 megabits a second (mb/s) with many rooms now offering connection speeds up to 2000 mb/s. This is the fastest and most secure way of getting internet and is the method recommended by college. The process of connecting is as simple as plugging an Ethernet cable into the wall socket and your laptop. Plug the ethernet cable into your device. Ensure you are not accidentally connected to a wifi network which could interfere with the wired registration process. 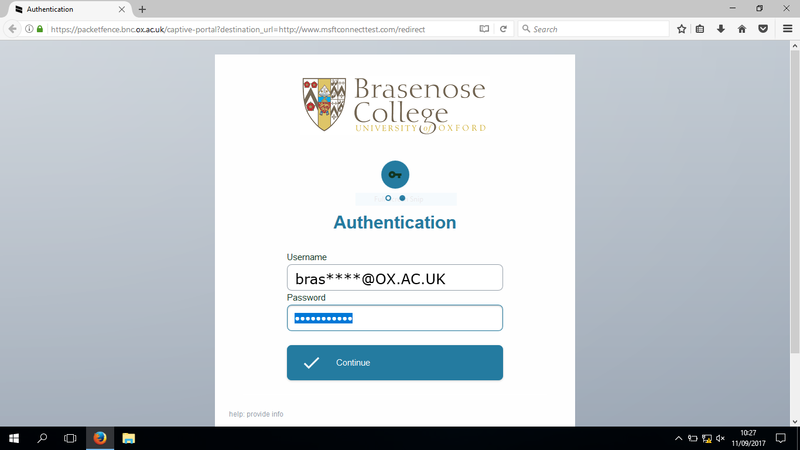 Students: You use your Remote Access SSO (RASSO) credentials, which you configured at http://register.ox.ac.uk after logging in to your normal SSO account. For more information about username types click here. Conference Guests: You will have been provided with an IT pack on arrival containing these credentials. Press continue. If the credentials are correct you will advance to the next page as shown. Wait for the bar at the bottom to complete. Depending on your device you may see a connection error as below, however this is OK, just close the browser, wait 30 seconds, and try a different webpage. You should now be on the network. The easiest thing to check is that your computer’s network port is enabled. To do this, go to “Control Panel” and open “Networking and Sharing Centre” then “Change adapter settings” in the top left corner. Here, you can view all your possible network connections. You can enable any device by right clicking and clicking “Enable”. Your device may have statically assigned network credentials for a previous network connection you have had. Removing these and setting your network adapter to DHCP (Obtain credentials automatically) should rectify this. This guide from Microsoft should help ‘Setting DHCP‘. Your device may have already automatically connected to a wireless network such as OWL. To check this has not happened simply turn your wireless adapter off and try again. Bad Username or Password. This happens if the credentials you are using are wrong or your account has been locked or disabled. Please contact the IT Office for help. ‘Maximum Registrations Reached’. This happens if you have already registered five devices. Please contact the IT Office and we will assist in removing old registrations. PLEASE NOTE: Only ever register your own devices. If you register other user’s devices, you will be legally responsible for the usage of their device.